What Is Radiation Therapy Physics? 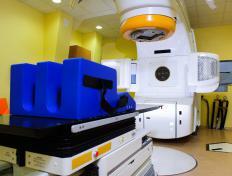 Radiation therapy physics is commonly involved in cancer treatment. Radiation therapy physics is a branch of physics focused on the use of radiation for therapeutic purposes, particularly in the management of cancers. Some specialists in this field work in research and development to create better equipment and treatment protocols. Others work directly in patient care to supervise patients undergoing radiation therapy and work with the medical team to develop an effective and appropriate treatment plan. Practice in this field requires a thorough grounding in anatomy, physiology, and radiation physics. Part of radiation therapy physics involves the development of new equipment for radiation therapy. The goal of radiation therapy is to destroy or disrupt cancerous cells, with minimal damage to other structures in the body. Equipment that can precisely target cancers is desirable, which requires advanced computer systems to calculate and control the beams of radiation. In addition, radiation therapy physics requires the development of dosing protocols and monitoring systems to assess the amount of radiation exposure for patients and care providers. Safety is a significant concern with radiation therapy physics, not just in cancer care but also in the use of radiation for medical imaging studies. These researchers balance the benefits of controlled radiation with the risks of radiation exposure to develop the best techniques for patient care. This can include reassessment of existing systems. A specialist in radiation therapy physics can also be responsible for ordering, maintaining, and managing equipment used in radiation therapy at a specific facility. In patient care, a consultant in radiation therapy physics can help select the best treatment and design a treatment plan. This specialist works with other doctors to discuss the specifics of the case and the goals of treatment. Awareness of the science behind radiation therapy allows the specialist to recommend the type of radiation, dosage, equipment, and other specifications of treatment. This includes dosimetry, the precise science of targeting radiation doses at a specific patient in response to known information about the case. Practice in radiation therapy physics requires a college or university degree. Precise requirements can vary between regions, but many practitioners have doctorate degrees in physics and some also have medical degrees to allow them to work directly with patients. Continuing education is also an important part of the work, as radiation therapy is subject to continuous research and development that all care providers in this field need to keep up with. Conferences, trade publications, and classes provide continuing education opportunities to radiation therapy physicists who want to offer the best possible care to their patients. What Factors Affect a Medical Physicist's Salary? What Is the Relationship between Medical Imaging and Physics? What Is a Medical Imaging Consultant?